(CNN) -- It's the perfect romantic scene. A dashing world leader drops in on his model wife, she touches him affectionately as their dogs play at their feet. 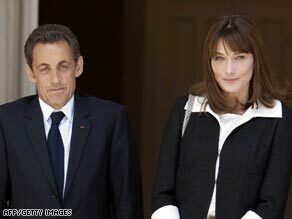 Nicolas Sarkozy and Carla Bruni have played the loved-up couple for the cameras. He, dressed in an immaculate suit and with a folder under his arm, tells her he is hot and sweaty after working out -- she wipes the sweat away from his face and pats his bottom, saying how lovely it is to see him. If this was a Mills & Boon novel it would be time for some romantic action in front of the fireplace, however, the French President Nicolas Sarkozy and his wife, Carla Bruni, are surrounded by a room full of journalists. Sarkozy's apparently spontaneous visit to say hello to his musician and model wife while she was being interviewed by journalists from French magazine Femme Actuelle last week has become an Internet sensation. In the video, if you can stomach watching all of it, Bruni and Sarkozy touch each other continuously during his two-minute visit. He talks briefly about being busy as the couple's golden labrador and a smaller dog merrily wag their tails and then he is off -- just as spontaneously as he arrived. Bruni and Sarkozy married on February 2 last year after only dating for 11 weeks. They have courted the press throughout their relationship, a big change for French presidents who have traditionally kept their love lives locked well behind the Elysée Palace's doors.